Model Number 25SAT35HDD. Do not expect to get the drive pictured. It is very unlikely that that specific drive is still in our inventory. Erased (DoD 5220.22 M Compliant) and tested good (Not formatted, partitioned, or allocated). ‣ Keyboard / Mouse. OutletPC was founded in 2001 and since then we've been focused on getting people around the world great deals on computer products, systems, and hardware. We've built a great selection over the years of all types of PC parts you can choose from to build, upgrade, or buy a desktop or laptop. 3.5in Hard Drive to 5.25in Front Bay Bracket Adapter - StarTech BRACKETFDBK. This plastic, floppy-drive adapter bracket lets you install a 3.5in floppy drive into a 5.25in bay. Black plastic bezel. Mount a front bay 3.5in floppy drive into a computer case with only an available 5.25in bay. All 3 are new box. Product ID:BRACKET25SAT. 1 - Data/Power Adapter Cable. Compatible Drive Types SATA. Drive Size 2.5in. Drive Connectors 1 - SATA Data & Power Combo (7 15 pin) Receptacle. Host Connectors 1 - LP4 (4 pin; Large Drive Power) Male. Mount up to two 2.5in drives into a single 3.5in bay. StarTech IDE Hard Drive Adapter. Adapts 2.5" IDE Drives to 3.5" Drive Bays. 40-pin to 44-pin IDE Adapter. ‣ Keyboard / Mouse. OutletPC was founded in 2001 and since then we've been focused on getting people around the world great deals on computer products, systems, and hardware. Learn more aboutSTARTECH BRACKET25. Mount a 2.5" IDE hard drive to 3.5" bay This Drive Bay Mounting Bracket Kit allows you to install a 2.5" IDE hard drive into an unused 3.5" bay in a desktop chassis. StarTech BRACKET25X2. Product # BRACKET25X2. Mount two 2.5in SATA SSDs/HDDs into a single 3.5in drive bay. The BRACKET25X2 Dual hard drive mounting bracket kit enables you to maximize the internal mounting space of your computer, by installing two 2.5in SATA hard drives (HDD) or solid state drives (SSD) into a single 3.5in mounting bay. Docking Station. NO MANUAL. Power Adapter. Docking Station. - USB Cable. Transform virtually any 2.5" SATA II (SATA /300) or SATA (SATA /150) notebook hard drive into the perfect portable storage solution! A truly portable solution, SAT2510BU2 features a lightweight, yet durable aluminum construction, as well as a small form factor, piano black design that fits perfectly into your pocket or notebook bag when not in use. Bracket225pt Startech.Com Dual 2.5" Ssd/Hdd Mounting Bracket For 3.5” Drive Bay. MODEL NUMBER: Bracket225pt. PART NUMBER: Bracket225pt. We are not responsible for any typographical errors. Review pictures for more details. Our goal is to provide exceptional service. Model: Bracket225pt. BULK OF 20. StarTech 25SATSAS35. Product # 25SATSAS35. Turn Virtually any 2.5" SATA or SAS Hard Drive into a 3.5" SATA Drive. 25SATSAS35 Features Drive Interface: 6Gb/s SAS. The Drive Converter features a trayless design for simple drive installation and removal, and is constructed of durable, yet lightweight plastics, with ventilation openings to aid air flow and help keep hard drives running cooler. These drive caddies are still with the OEM boxes - one has been taken out for photos but does not look to have been used at all. Listing is for one (1) unit only. Manufacturer Part Number BRACKET25. Product Model BRACKET25. Mount a 2.5in IDE hard drive to any computer with an available 3.5in bay. This Drive Bay Mounting Bracket Kit lets you mount a 2.5in hard drive in a 3.5in drive bay, allowing you to maximize the internal space-efficiency of your computer case. New without box StarTech 2.5" to 3.5" SATA HDD Converter. Trending at $20.66eBay determines this price through a machine learned model of the product's sale prices within the last 90 days. A Dura Micro AC adapter is included with one of the two Thermaltake enclosures; the other five enclosures each have their original OEM adapaters. So, you are getting six usable eSATA / USB external 3.5" drive enclosures with all necessary hardware. StarTech CFAST2SAT25. Product # CFAST2SAT25. CFAST2SAT25 Features Convert your CFast card into a 2.5in SATA drive for faster data transfer. This unique adapter lets you access and recover data from a CFast card through SATA at faster data transfer speeds. This 2.5" hard drive tray lets you add even more flexibility to how you manage your data storage with the SATSASBP425 and SATSASBP125 series backplanes. StarTech SATSASTRX25. Product # SATSASTRX25. SATSASTRX25 Features. COMES AS SHOWN! Comes from reliable source. NEW. 1. We are surplus equipment dealers and do not have the ability or knowledge to test equipment for functionality beyond plugging it in and describing what we observe as best we can. 2 You are purchasing used equipment – most is untested as stated in our description. Please reach out to us directly if there is a problem. We are quick to respond and resolve. NO REFUNDS OR RETURNS are given for parts/repair items or freight items. Used items have a 30-day return. 3. We have no knowledge of the history of the equipment. SuperSpeed USB 3.0 to 2.5/3.5in. Sata HDD Docking Station. Only the main base unit included. See photos for details. This 2.5" hard drive tray lets you add even more flexibility to how you manage your data storage with the SATSASBP425 and SATSASBP125 series backplanes. 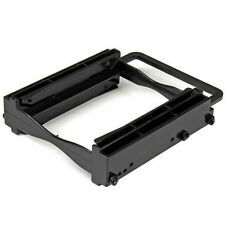 The drive tray supports both SAS and SATA 2.5” drives, ranging from 5 to 15mm in height. HDD size 2.5". HDD interface IDE/ATA,Serial ATA. Protecting against excessive heat build-up maximizes the life of your drives. Increase the performance and data storage capacity of your desktop computer or enhance your server room storage, with this 4-drive mounting bracket kit for 2.5” solid-state drives or hard drives. Here’s an easy way to increase the speed, capacity and data security of your desktop computer or server. 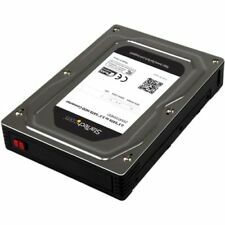 The M.2 adapter increases overall storage potential by installing four M.2 NGFF (Next Generation Form Factor) SSDs in a standard 3.5” drive bay. This 4-bay 3.5" SATA/SAS backplane, installed into three standard 5.25” front drive bays, makes it easy to swap 3.5” SATA or SAS drives in and out of your server or desktop computer. With its durable plastic and aluminum construction, it provides a cost-effective solution for drive maintenance and interchangeability of data between multiple systems. 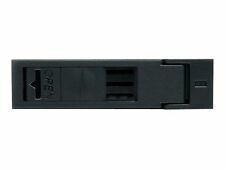 This 3.5in SATA hard drive hot-swap bay allows you to install two 2.5in SATA hard drives (HDD) or solid state drives (SSD) in an available/unused 3.5in floppy drive bay. LED indicators Activity,Power. This HDD rack lets you install two 2.5” SATA hard drives or solid-state drives into a single 3.5” front bay. - Increase drive capacity, performance, or data redundancy, with multiple RAID modes: RAID 0, RAID 1, spanning. Number of HDDs supported 1. This 2.5" to 3.5" hard drive adapter lets you install a 2.5" SATA or SAS hard drive (HDD) or solid-state drive (SSD) into an internal or external 3.5" drive bay, using standard drive-mounting holes. This removable hard drive hot-swap bay makes it easy to swap 3.5” SATA or SAS drives in and out of your server or desktop computer, using an available 5.25” front drive bay. With its durable plastic and aluminum construction, it provides a cost-effective solution for drive maintenance and interchangeability of data between multiple systems.